TBicycle trainers are available in two basic architectures: Mechanical Resistance Bike trainers and Roller Bicycle Trainers and can be found in models designed to fit your requirements for training, as well as your budget. As you will see from the following article, you will also notice that Mechanical Resistance Bike trainers can be broken down into their own categories, we will also cover those as we go. When you are trying to decide on the right product, you will want to know how much the price affects the quality, training requirements, ease of use and the type of bike desired. This style of bicycle trainer uses a device to hamper the movement of the wheel and consists of a frame holding the rear tire in a vertical position. The mechanic resistance trainer comes in three basic types: magnetic, fluid and wind. The mechanism providing the resistance has to connect to the wheel, so there are two devices used for this type of connection: pro and trim. It is easier to keep your balance as the bike is held stationary by the use of the frame. It provides a full body workout and fulfills its duty to enhance your cycling skills. Most workouts and indoor cycling DVDs that are tailored towards the mechanical resistance bicycle trainers. This type of trainer is much more expensive. You also will not get the flex from the ability to move your upper body left to right as you could with the roller trainer. This style is recommended for the more casual and less intense biker to the devoted calorie burner and on up to the dedicated race cyclist. Beginners as well as veterans use these bike trainers. Wind, magnetic and fluid are the three different mechanisms used for resistance training. This provides you with a quiet and effective ride. It is the most costly investment of all the trainers. A mat under the mechanism is essential in order to catch any leaks or overflows. The silicon fluid used within the housing unit will cause permanent staining if it does leak. A combination of fluid and mechanical resistance has greatly diminished the possibility of leaking around the drive shaft as is common with this type of mechanism, because it does not have one. This trainer incorporates ‘rare earth’ magnets that hamper and restrain the turning motion of the bike tires. It provides an adjustable, smooth and quiet ride. Occasionally, the rider will ride too strong for this type of mechanism and the magnets can slip. A combination of magnetic and fluid resistance will eliminate this occurrence from happening. This style of bicycle trainer utilizes a large fan so when you are pedaling it will provide a specified level of resistance. This is the most affordable resistance trainer choice. This additional option will give the biker a genuine sense of motion, such as when coasting on a bicycle, and will increase the resistance to any sudden accelerations. With this type, bigger is definitely better. However, if your sole concern is just in burning calories, this additional option may not be necessary for you. Some bicycle trainers’ designs will let you adjust the resistance level accordingly. In addition, there are some available that use remote technology to let you change the resistance right from controls installed on the handlebar. Unless you are training specifically for a race or an event, this extensive addition is not needed as once you hit your comfort level, you will not need to adjust the resistance level after that. Bicycle trainers can be a bit dull and boring compared to genuine bike riding as there is no changing scenery or challenging road conditions to keep you entertained and engaged. There are some visual stimulating training programs available in order to give you an assorted workout that will encourage you to push harder and train longer. This style of trainer raises the front tire. If you do not do this, you will more than likely have a downhill feeling as you train. A wheel riser lifts the front tire which in turn levels out the bicycle. Some advanced designs will allow the side to side motion of the tire in order to involve the upper body. This is a high-end bicycle trainer that allows the bike to shift from right to left and back as you shift from one leg to the other with a spring loaded pivoting device. This gives you the invaluable ability to exercise your upper body and all with the insurance that the bike will not over as it is securely held firm. 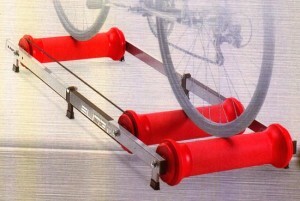 The roller bicycle trainer is the least expensive style to choose from. It also delivers a more authentic feel as it requires you to maintain your own balance and exercises your upper body, as well. This design also allows you to shift your torso to the right or left when you are pedaling, just as you would under genuine riding conditions. It will take much practice and even more time for even the most adept cyclists to master the roller trainer and to maintain your balance. It is imperative that you are prepared to handle falling until you get the hang of it. Another drawback is you can not use tires commonly found on mountain bikes, such as the knobby tires. There is also no resistance, unless you down shift, which in turn does not mimic authentic riding conditions. Most Indoor Cycle DVDs are tailored towards mechanical resistance trainers not rollers.